Planning a family reunion with Colorado as your destination? Our conveniently located Idaho Springs Base Camp makes it easy for your family to gather for an unforgettable adventure. Just a short drive from the Denver Metro area, and an easy drive from Summit County, Winter park and Vail, your group can choose from a variety of whitewater rafting levels on Clear Creek, an eight line high tower zip line course, and the brand new Colorado Sky Trek Adventure Park. The best part about planning your family reunion adventure with the Colorado Adventure Center is that you have lots of options! We offer several different activities at one convenient location so the entire family will be able to participate in one or a number of fun adventures! Young and old! How about sending the little ones down the beginner rafting section of Clear Creek (with a supervisor of course) or let them loose on the Colorado Sky Trek beginner course to burn off some of that excess energy? Naturally the teens will want to hang out together challenging each other (and themselves), so why not send them out to paddle hard down Clear Creek on our Intermediate Raft Trip. Let them see who out paddles who, while the older generation experiences the thrill (and not too much work) of soaring through the air on the best high tower zip line in Colorado! If you’d prefer to all be together at the same time, our brand new Sky Trek Aerial Adventure Course, with three levels of difficulty and fun, can accommodate the entire crew! Mix it up and have a blast! You can enjoy a fresh grilled lunch all together on the banks of Clear Creek. How cool is that? An adventure filled day with the Colorado Adventure Center will be the highlight of your family reunion’s Colorado experience. For the family reunion organizer . . . relax! Leave the details and work to us and we’ll plan out your perfect Colorado day of adventures for the entire group. Our friendly Group Sales Agents will make planning your family reunion’s unforgettable day of fun in the sun easy. 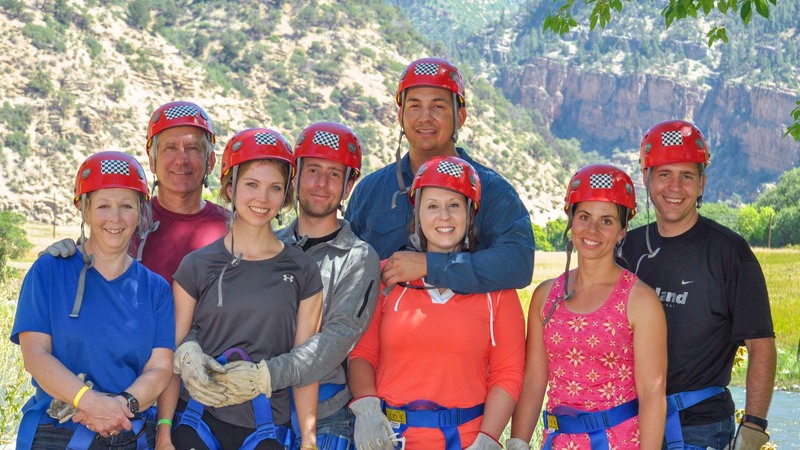 Whether it’s whitewater rafting on Clear Creek, zipping across 65′ high lines or tackling the challenges of the newest Sky Trekking course in Colorado, we’ll help find the perfect adventure for your family’s skill level, schedule, and budget. Call 1.877.947.7238 or Request Info today to get your family on the adventure of a lifetime!